PRS looks, Fender-style materials and the excellent 'hybrid' pickups combine to create a unique and highly musical-sounding guitar. The NF pickups may be eye-jarring for some. PRS Narrowfield pickups: simple concept, brilliant delivery. A winning combination of Fender-style materials, Gibson influence and distinctive PRS style. They sound great, but the look of those pickups may not be to everyone's taste. The dual humbuckers that grace so many PRS guitars perhaps pigeonhole them as coming more from the Gibson side of the tone tracks. But from the first PRS guitars - such as the 25-year-old Custom, still PRS's bestselling instrument - PRS has offered single-coil tones via the original five-way switching and the later 'McCarty package'. And don't forget the smattering of guitars over the past quarter-decade that have featured true single-coil pickups, such as the 1988 Studio, the USA-made EGs, the later 513 and the SE EG. The 305, however, could be correctly seen as PRS's first 'proper' attempt to nail a more accurate Stratocaster-like single-coil sound. It seems PRS's artist programme was the genesis. "Basically Winn [Krozak, who heads up PRS's artist liaison] couldn't do his job without this guitar," Paul Smith told us recently. "There were too many people that wanted that tone. It's like the player is missing the colour blue, he needs that colour to paint." You might remember that The Swamp Ash Special was introduced in the mid-nineties to do that very job. Having been superseded by the 305 it was dropped from PRS's core line this year, only to re-appear in the 25th Anniversary line-up with a trio of the latest PRS Narrowfield humbuckers. The original Swamp Ash Special was introduced in 1996. Its swamp ash body, bolt-on maple neck and single-coil-sized humbucker flanked by two normal 'buckers all pointed to a more Fender-intended tonality. This year's model remains pretty much the same - nicely figured swamp ash body, 634mm (25-inch) scale bolt-on maple neck and fingerboard, and a vibrato - the major difference is the new pickups: neatly designed mini-humbuckers. Although they use the same wire as the full-sized 57/08 'buckers, these sense a narrower portion of the string - like a single-coil - and have a less specific tonal intent: they're not hum-cancelling single-coils, nor single-coil-sized humbuckers meant to emulate a full-sized humbucker (although you can't help thinking that here). With three Narrowfields, a five-way selector and bolt-on maple neck, it's as if the SAS is chasing a similar player as the 305. Sound-wise, things take a different path. Instead of the crystalline 305 sounds, we have a hotter output that's definitely more humbucker-like with thicker mids and a rounder high-end. Yet with the construction of the guitar there's still plenty of Fenderness to it: a slightly tighter low-end response than the 305 and a little more 'chop' to the tone. The three pickups are nicely graduated from the bridge's brighter push through to the mellower, but not over-soft neck pickup. As ever, that middle pickup is a good place to start to work yourself a brighter or darker edge to your tone. The mixes again have a Stratiness to them, but they're thicker and the pickups are hum-cancelling in all positions, which might be a factor if you're particularly bugged by hum at gigs or in the studio. As you wind up the gain and volume, the SAS eases into 'hot country' territory and pretty much every genre you want to throw at it. As ever it cleans up nicely and even with a mid-gained amp you can pull down the volume, knock back the tone and do a passable Gibson semi jazz tone. There's power and mid-range clout but it's not overdone. You don't get that explosive twang from the low strings but there's still sparkle. Smith references P-90-style sounds and Gibson's mini-humbucker, and those are accurate. The caveat, perhaps, is that the 305 is the Fender to the SAS NF's Gibson in terms of tonal character. Built to the company's usual ultra-high standards this 25th Anniversary guitar certainly dishes-up a different flavour, or provides a different coloured crayon as Paul Reed Smith would have it. 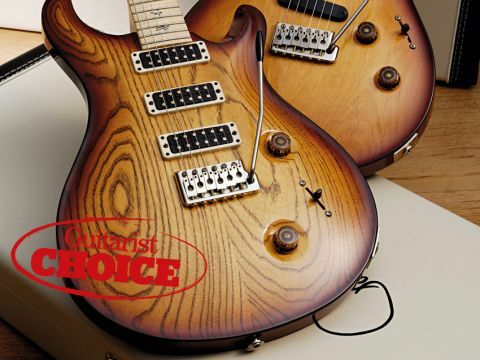 The addition of the Narrowfields to the Swamp Ash Special is an inspired move. These pickups really combine the sparkle of a single-coil with the smoother width of a classic humbucker; the Strat-like configuration, not to mention the woods used, adding a more Fender-y foundation. "The Narrowfields sound like really clear, beautiful humbuckers," says Paul Reed Smith summing up how he hears the tonal differences. "I think that the Narrowfield is the best sounding baby humbucker I've ever heard." Our only dilemma is, between this guitar and PRS's other 25th Anniversary model - the 305 - which one we prefer, and with PRS's 2010 Experience just around the corner - usually the time when next year's models are announced - and the fact the 25th 305 is a limited run of 305 only, time is running out for us to choose. Don't say we didn't warn you!